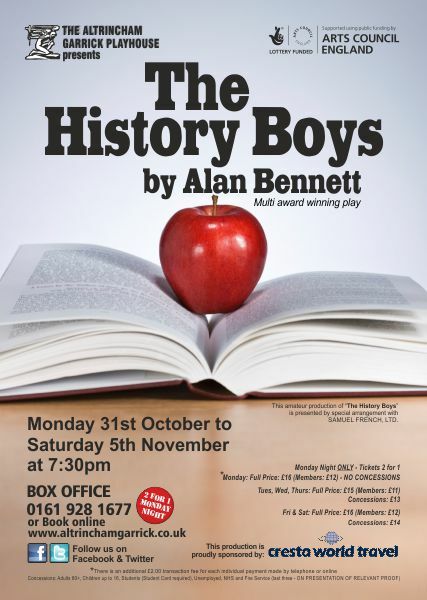 The History Boys sees its second outing at the Garrick after finding great success with our audiences. 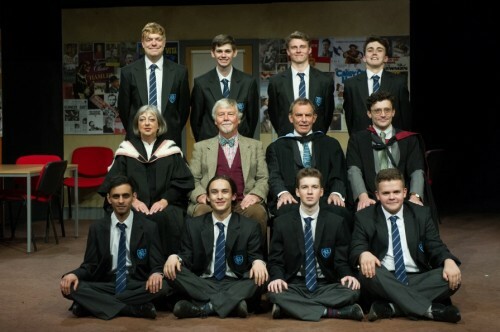 The play opens in Cutlers’ Grammar School, Sheffield, a fictional boys’ grammar school in the North of England. Set in the early 1980s, the play follows a group of history pupils preparing for the Oxford and Cambridge entrance examinations under the guidance of three teachers (Hector, Irwin, and Lintott) with contrasting styles. Hector, an eccentric teacher, delights in knowledge for its own sake, but the headmaster ambitiously wants the school to move up the academic league table; Irwin, a supply teacher, is hired to introduce a rather more cynical and ruthless style of teaching. Hector is discovered sexually fondling a boy and later Irwin’s latent homosexual inclinations emerge. Review from Rick Bowen – Stagestruck? WHEN I interviewed Alan Bennett he insisted this fabulous play wasn’t a critique of the education system and the way it acts as a never ending production line producing academic robots. Even though, in the avuncular Hector we have a teacher who flies the flag for free thinking, engaging his lively and engaging young charges like no other member of staff. We all love Hector, a gift of a role for Richard Sails, who certainly doesn’t look a gift horse in thee mouth here. This is a fine performance from Sails, who commands the stage even when bouts of unruliness break out in his classroom. Young teacher Irwin – yet another eye catching performance from the consistently impressive Anthony Morris – is a second rate substitute. He struggles to cope with this challenging bunch of boys, who have begun what they hope will be an academic journey to Oxbridge. Hector, on the other hand, would prefer them to be well rounded individuals with enquiring minds that transcend the textbooks. Celia Bonner is terrific as Mrs Linott, the only female member of staff. I’ve harped on for a while about the exciting young stage talent emerging at this theatre and Gabriel Walker and David Beeby, who play students Dakin and Posner, are a classic casein point. Gabriel is very funny as Dakin, with his unique brand of philosophy and I like the way David handles his character’s burgeoning homosexuality. Top marks from me, of a production of a play by an undisputed national treasure. Go and bask in Bennett’s brilliance. We wish Julia Taylor a speedy recovery, but having just come out of hospital, she will not be able to review The History Boys. Julia has done much to promote local amateur theatre with her many reviews of our productions both for the Sale and Altrincham Messenger and for Remotegoat. This amateur production of ?The History Boys? is presented by special arrangement with SAMUEL FRENCH, LTD.